Learning English is one of the most important things you can do, and it’s one of the best ways to spend your time. Studying English is something that’ going to benefit you for the rest of your life. There is SO MUCH good information that you can find only in English. Whether it’s books, internet texts, podcasts, or videos, there is much more high quality, impartial information out there in English that in any other language. You see there’s information about each individual language’s knowledge on the subject, and there’s the knowledge of every language on the subject—which comes out in English. The more you study English, the easier it is to learn about ANYTHING. The better your English is, the quicker and easier you can learn from all the great sources of English media. Even if you can read faster in your native language, the time you invest into reading or improving your listening skills in English will have a much greater return on investment [the more time you spend, the greater your reward] over time. After all, all the sciences and businesses of the world communicate through English. If that doesn’t show you just how important learning English is for becoming smarter and more successful, I don’t know what will. And it’s not because there’s anything special about the English language itself, it’s just that it’s the language that unites all cultures. So by learning English, you’re not only connecting with all billions the native English speakers, you’re allowing yourself another doorway to connect with every other culture in the world. Because it’s the language that connects all cultures, English has, by far, the widest range and deepest depth of information. You’ll find, as a whole, much higher quality of information from a much wider range of interests. And that’s not to say that everything in English is better than everything that’s in other languages. Because English is the most widely spoken language in the world, there’s just as much bad information out there as good. But with the internet, it’s easier than ever to find good information. Because of the breadth and depth of information in English, studying English is one of the most important things you can do. If you want to learn about personal development, business, entrepreneurship, lifestyle design, or whatever hobby you have, the best of the best information out there is in English. If you like to travel or interact with foreigners, you’ve probably experienced how important it is to speak English. You could be at a hostel in Russia, with people from Switerzland, France, Brazil, Australia, Spain, India, and China, and you can likely speak to all of them in English. No other language can claim to do that. So learning English is going to help you connect with people from all cultures. Every day, more and more people are learning and becoming fluent in English. Every day, language barriers are being broken by people learning to speak English. Because English is the language that connects all people, if you’re not learning it, you’re creating a barrier to connecting with the rest of the world. Plus, you’re limiting your available input of knowledge. There is such a wide breadth and depth of information in English that you’re giving yourself a handicap [making life hard on yourself] if you’re only learning from other languages. If you struggle with keeping a commitment to learning English, use the powerful technique in the article, How to Ensure Language Learning success—30 Day Trial to make sure you follow through with [complete] your goals. For more information about practicing English every day, check out our lifestyle English articles. 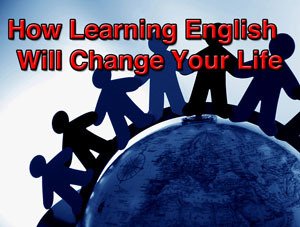 Return from How Learning English Will Change Your Life to lifestyle English articles.